National surveys consistently reveal that an inordinate number of students report high levels of boredom, anger, and stress in school, which often leads to their disengagement from critical learning and social development. If the ultimate goal of schools is to educate young people to become responsible and critically thinking citizens who can succeed in life, understanding factors that stimulate them to become active agents in their own leaning is critical. A new field labeled "positive psychology" is one lens that can be used to investigate factors that facilitate a student's sense of agency and active school engagement. 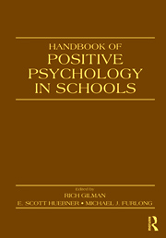 The purposes of this groundbreaking Handbook are to 1) describe ways that positive emotions, traits, and institutions promote school achievement and healthy social/emotional development 2) describe how specific positive-psychological constructs relate to students and schools and support the delivery of school-based services and 3) describe the application of positive psychology to educational policy making. By doing so, the book provides a long-needed centerpiece around which the field can continue to grow in an organized and interdisciplinary manner.